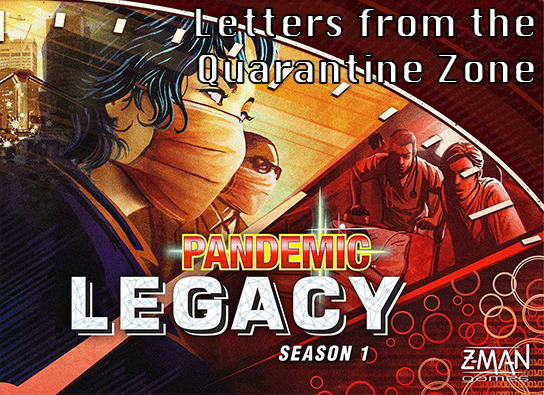 Spoiler Warning: Letters from the Quarantine Zone is a recap of a playthrough of the board game Pandemic Legacy (an After Action Report, if you will), retold in-character. Though the series does not directly acknowledge game mechanics or cards, it references their content, and the events from the game described within may result in spoilers. This is a work of fiction. You can read the entire series here. Well, 2016 is off with a bang. First there were fireworks, then there was sickness. I’ll say one thing: it’s never a dull day at the Centers for Disease Control. At least the weather has been nice here in Atlanta. The media is calling this the “January of our Discontent.” Clever. They don’t know the half of it. Where should I start? Reports first surfaced in New York, Chicago, and Buenos Aires. Hospitals and infirmaries seemed to swell to capacity overnight with some new disease showing fast symptoms and high contagion. We immediately dispatched agents to support the local healthcare infrastructure just as Santiago, San Francisco, and Taipei–yeah, across the freakin’ Pacific Ocean–reported additional victims. There were other cities, of course, but these were the most urgent. The hard work of our medical details in the United States and South America cleared the way for us to dispatch our research team to Bangkok, where a disease the media has conveniently declared “REDRUM” was spreading from Taipei to Bangkok and Jakarta. In Bangkok, we assembled some of the greatest minds in the Pacific Rim at a temporary research station, and put all of our resources into solving the REDRUM crisis before it spread to all of Asia’s considerable population centers. It was successful, but I will always wonder if we were too aggressive in trying to contain REDRUM. We knew it could develop into a huge problem, but diverting all of our focus to its cure distracted us from a plague that was emerging in Chennai. The Chennai outbreak was a global crisis: a mutated disease, dubbed C0dA-403a internally, that has proven more difficult to treat that we could have imagined. The panic… Oh Lord, the panic the outbreak caused. Fortunately, we were able to scramble a team from Bangkok to Chennai to quell the unrest before the city was totally consumed by rioting, but the city is quite shaken and the entire Indian subcontinent wearily watches as events unfold. While the outbreak in Chennai was both avoidable and regrettable, ultimately the respite we earned for ourselves by curing and eliminating REDRUM gave us the capacity we needed to handle sudden flare-ups in Miami, Lagos and Algiers, while we developed reliable treatments and suppressants–I hesitate to say “cure”–for their local ailments. By mid-January, the coast was clear. Our initial assessments and research are clear: we have classified four major strains of pathogen responsible for the January of Our Discontent. For simplicity, our CDC shorthand is Blue, Yellow, Black (C0dA-403a), and Red (REDRUM). As far as we can tell, Blue, Yellow, and Black haven’t really caught the media’s attention, but I’m sure they’ll conjure up an equally alarming common name when it does. Of course, no good deed goes unpunished. I’m immensely proud of our team’s response and our success, and for our trouble, I was honored to receive a call from the President himself. After congratulating us on a job well done, Mr. President informed me that, since we clearly had the situation in hand, he needed to remain vigilant of government waste and decided to slash our budget in half. What a myopic disaster! Multiple major pathogens, across the world, emerging within a week of each other. Sure, we handled it, but only just. The President and Congress, of course, don’t see it that way. They’re all political animals. They see the media. They see that 2016 is an election year, and they know that the CDC only earns you votes when its got a crisis to solve. This is a mistake, perhaps a critical one. Here’s what they don’t get: January is just the first act of a story that will play out over at least a year, and maybe longer. These are highly mutable diseases, and they’ll almost certainly be back on our radar soon; we have resolved the immediate concerns, but we haven’t addressed the underlying causes. Budget cuts or not, our team here at the CDC must remain ever vigilant in dealing with these threats. Despite our reduction in funding, we have a few advantages the next time we have to face a crisis. Our medical teams have developed local connections around the globe that should extend our reach in treating these diseases. We’ve also completed valuable molecular sequencing on REDRUM; as luck would have it, it shares a common structure with lyssaviruses, so future strains should be easier to cure. It’s just rabies on steroids. Ha, “just rabies on steroids.” Now I’m beginning to sound like the President.